I just wanted to share with you a really easy way to win some goodies from my friends at www.SedonaLace.com. You may be familiar with my tutorials using the 10 pan concealer palette, the 120 eyeshadow palette, and the 88 matte eyeshadow palette. I received all of these items for this company and they've decided to extend the giveaways to you all! To see how to win, click here! This is probably one of the easiest ways to win. Visit Sedona Lace on facebook and friend them. That's it! Many of us are Facebook addicts so just make sure to stop by Sedona Lace's page next time you check your inbox or your friends' new pics. 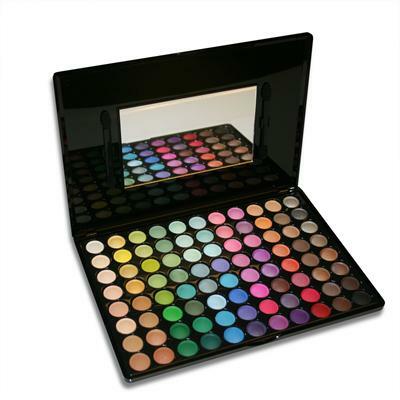 This Friday, 5/28/10, they are giving away an 88 Matte Eyeshadow Palette. Each Friday they'll be giving away something new. Good luck! For those of you interested in purchasing from the site, don't forget to use code renren for $4.00 off your entire order. The code does not expire. Stay tuned for two more reviews of products from Sedona Lace...their mineral makeup line and makeup brush set. Did I mention there will be giveaways for these items as well? Get excited!